Dandelion herb (Pugongying)-Taraxacum mongolicum Hand.-Mazz. Botanical Name: 1. Taraxacum mongolicum Hand.-Mazz. ; 2. Taraxacum sinicum Kitag. Part Used & Method for Pharmaceutical Preparations: The whole plant is gathered in summer or autumn, cleaned in water and then dried in the sun. Functions: 1. To clear heat and release toxins; 2. To resolve dampness. 1. Boils, carbuncles and furuncles. Dandelion herb (Pugongying) is used with Viola (Zihuadiding), Wild chrysanthemum flower (Yejuhua) and Honeysuckle flower (Jinyinhua). 2. Damp-heat jaundice. 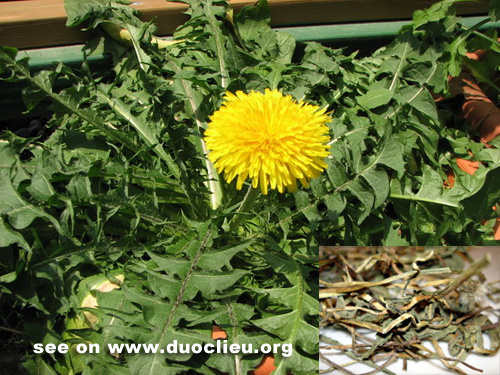 Dandelion herb (Pugongying) is used with Oriental wormwood (Yinchenhao). 3. Turbid urination. Dandelion herb (Pugongying) is used with Lysimachia (Jinqiancao) and Imperata rhizome (Baimaogen).